Originally known as the Business PC “expandable system”, the Atari PC2 was first introduced in November 1987 at COMDEX ’87. Sporting a new purpose built chassis instead of reusing an existing design, it had the same specifications as the PC1 but without the expansion card restrictions. 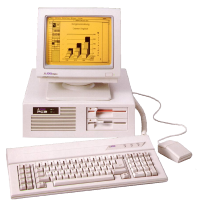 The larger chassis also allowed for multiple drive configurations and it was sold with either two 5.25″ Floppy Drives or a single 5.25″ drive and 20 MB Hard Drive.